Scott and Marge Hayes bought their 40-acre tree farm in 1996, built their home in 1999, and then focused on improving their woodland. Over the past ten years, they have thinned about sixty thousand board feet of Douglas-fir small logs, thereby improving the health of the forest stands. Since 2009, they have cut boughs of Western White Pine, Ponderosa pine and other species for sale through the Oregon Woodlands Cooperative. 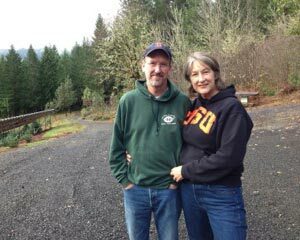 Scott and Marge have been members of the Washington County Small Woodlands Association since 1996 and now Scott is the president of the Oregon Small Woodlands Association. He is a 1974 graduate from Oregon State University with a forestry degree and worked 31 years for the Oregon Department of Forestry. Marge is a 1989 graduate from Oregon State with a major in Apparel Design. She worked for Nike for 14 years, earned a technical degree in horticulture before working for Hines Nursery, and is a Master Gardener. They retired in 2005 and enjoy working on the tree farm, gardening, traveling and having fun.